The road to success begins with graduation. 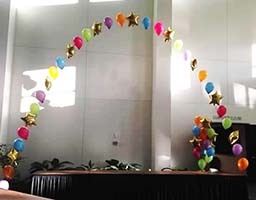 Balloonatics provides decorations to celebrate all of these ceremonies which mark milestones of life. From preschool, primary school and high school through college, graduate school, and trade or specialty school, all graduations recognize significant achievement and future success. 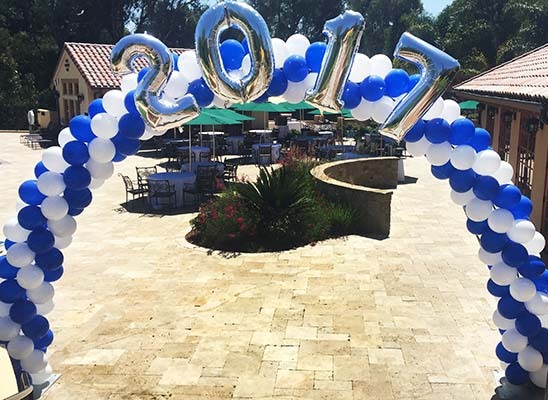 Let Balloonatics celebration artists create colorful and unique decorations for your graduation party or celebration in the design of your choice. We can incorporate mortarboards, diplomas, affirmations, school colors or mascots into any design. 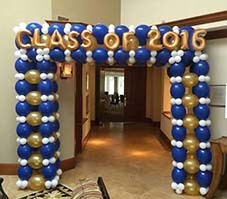 Your graduate will enjoy unforgettable balloon arches, columns, centerpieces, props, signs or full-size silhouettes in FoamCor®. 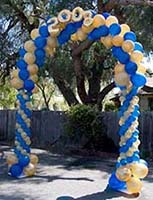 Balloonatics arches for your graduation or class reunion can include your school colors, class year or mascot's name. Graduation Year Tower and Mortar Board columns can include class colors. "Congratulations Grad" and "Way to Go Grad" centerpieces communicate recognition of the graduate's achievement.